EPA's Push For More Ethanol Could Be Too Little, Too Late The U.S. Environmental Protection Agency could soon issue a final ruling that aims to force oil companies to replace E10, gasoline mixed with 10 percent ethanol, with E15. This move could come just as widespread support for ethanol, which is made from corn, appears to be eroding. 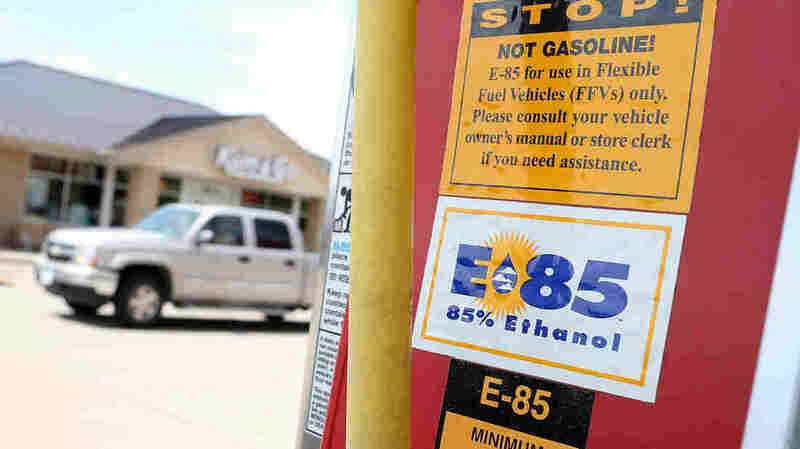 A decal advertising E85 ethanol is displayed on a pump at a gas station in Johnston, Iowa. The U.S. Environmental Protection Agency could soon issue a final ruling that aims to force oil companies to replace E10, gasoline mixed with 10 percent ethanol, with E15. This move could come just as widespread support for ethanol, which is made from corn, appears to be eroding. Mike Mitchell was once a true believer in ethanol as a homegrown solution to foreign oil imports. He owns gas stations, and he went further than most, installing expensive blender pumps that let customers choose E15, E20 and all the way up to E85. The result was a variation on the old adage, "You can lead a horse to water, but you can't make it drink." "We're environmental people and we kind of jumped on the bandwagon early, and it bit us," Mitchell says. Many car companies, especially the Detroit Three, have been making vehicles that can use the higher blends of ethanol for more than a decade. They're called "flex-fuel" vehicles. Most people who own those cars still use the lowest ethanol blend they can find, because ethanol negatively affects gas mileage. Philip Verleger, an economist who tracks the oil industry, says when Congress approved the Renewable Fuel Standard in 2007, foreign oil imports were rising. Then came tar sands and new ways to drill for oil. "The oil crisis is going away," Verleger says. "We have plenty of oil. We have too much oil." Verleger says the switch to E10 was driven by the Clean Air Act to reduce smog, and it worked pretty well. The switch to E15, however, is being driven by the renewable fuel mandate, which directs the EPA to require a greater volume of ethanol in gasoline every year, pretty much, no matter what. Even some environmental groups don't like that mandate, because corn ethanol requires so much energy and water to produce. "The need for the ethanol program is gone," Verleger says, "but the thing is ... once you get something it's very hard to undo it." Oil companies say they're absolutely not going to put E15 into the marketplace, and if they're forced, they'll take their product elsewhere. "It's my opinion that refiners have very limited choices in order to comply," says Andy Lipow, an oil industry consultant, "and one way to comply is to export ever-increasing amounts of gasoline and diesel fuel, or otherwise just simply shut down the refineries." That's a bluff, according to the Renewable Fuels Association, a trade group for the corn ethanol industry. Its president, Bob Dinneen, says the EPA should call that bluff. Dineen says this is the way Congress envisioned the mandate working: more and more ethanol over time in a gallon of fuel, and less and less petroleum. "This is about market share," Dinneen says. "This is about their profitability; it's not any more complicated than that." The problem is that the mandate applies only to the oil companies, not the people who blend the ethanol into the gas, and not the gas stations that buy the blended product. There's that "horse to water" problem again. Because half of all gas stations are completely independent of the oil companies, they could just keep ordering lower-ethanol gas, and they probably will. Even though the EPA says E15 is safe for any car built after 2001, car companies insist that it isn't. "There is no guarantee that fuel will work properly in your vehicle," says Brent Bailey. Bailey heads a research group that has done 20 studies on the effects of higher-ethanol blends on nonflex-fuel cars. He says while most cars will probably be fine, it's "a little bit like Russian roulette." "You may have plenty of blanks out there, but then there might be some damage in certain cases," Bailey says. While that might make for an interesting experiment, oil companies, car companies and gas stations are worried about class-action lawsuits. The petroleum industry is doing everything it can to postpone a showdown. If the EPA approves the increase, and if the refineries comply, E15 may show up in local gas stations sometime next year.